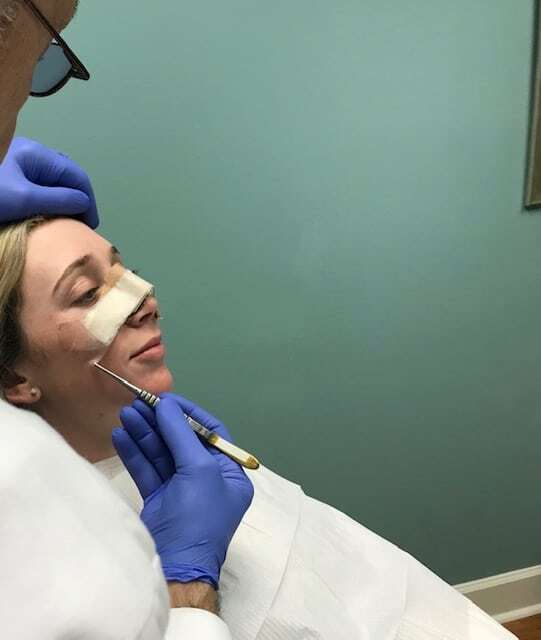 The most exciting day after rhinoplasty is to remove the splint – therefore unveiling the new nose. Removal of the splint is the culminating peak of a long process. Patients usually think about this for months if not years when until they decide to have a consultation. Most of our patients come from the previous patient’s family or friends who were pleased with our performance and the result. Once the consultation is completed, and the surgery scheduled next exciting moment is to remove the splint. Surgically we may have removed and refined the profile, created a much more elegant tip, rotated that tip up or down to create a much more aesthetically pleasing nose..and finally repositioning the bones. These procedures create a much more pleasing set of relationships and therefore must be immobilized for a period of time in order to maximize the result. Once the structural changes have been achieved and the packing and splint are in place the waiting begins. During this immediate several days there may be a focus on minimizing activity in order to achieve the best result. Not all surgeons will pack the nose but I believe it is if done properly essential to achieving the best immobilization and security after the operative procedure. the packing is removed within the first few days of surgery but the splint may remain on for 10 to 14 days depending upon the nature of the procedure. In my opinion, an external or COLUMELLAR scar is absolutely unnecessary for both primary rhinoplasty or revision rhinoplasty – even if rib cartilage grafting is required. There are significant disadvantages with the open rhinoplasty that prevent my opinion the most elegant nasal result. It’s my personal opinion that open rhinoplasty should be avoided unless there are such extreme circumstances present that require it. patients preoperatively before every case. Some plastic surgeons do not offer rhinoplasty. Be sure you evaluate the gallery completely before you decide who your rhinoplasty surgeon will be. Unquestionably the most dramatic moment for the patient is the day the splinters removed. Often times the patient will have friends and family as an audience for splint removal. I will often ask patient permission to film the split removal, recognizing this is a very emotional time. Once the patient is comfortable in the examination chair in my assistant disposition properly and slowly and carefully remove the tape and the splint revealing the new nose. We usually get a reaction from the family members and friends present. The patient gets a mirror and begins the mental process of incorporating the new nose into their personal image. Usually, there’s some swelling but the new configuration is clearly visible. This split removal day is usually filmed with the patient’s permission to memorialize this very significant and emotional day. Usually very fulfilling for all concerned.